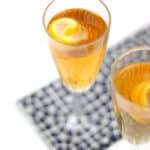 Stir ingredients briefly over ice, strain into a chilled flute, top with Champagne and garnish. In a cocktail shaker filled with ice, combine bourbon and triple sec. Shake gently. Strain into a champagne flute. Top with bitters, then champagne. Garnish with an orange twist.